These easy and tasty "Healthy Morning Carrot Berry Muffins" are a glorious way to start any day. They combine the great taste and chewy texture of carrots with the wonderful flavors of apple, cranberries, coconut, pecans, and honey. Of course they also make a great snack or lunchbox treat! Preheat oven to 350 degrees and grease a standard-sized muffin pan. Combine almond flour, cinnamon, baking soda, flax seeds and salt in a large bowl. Add carrots, apple, coconut, and dried cranberries, combining well. In a separate bowl, whisk eggs, honey, oil and vanilla extract together. Pour the wet mixture over the dry ingredients and mix very well. The batter should be very thick. Spoon the batter into muffin pan and place on the middle rack of your oven for 40-50 minutes. When a toothpick inserted into the top of a muffin comes out clean, the muffins are done. Cool muffins in the pan for 8-10 minutes, remove to a rack to finish cooling. The muffins look delicious. I've used almond flour in a cookie recipe, but not in muffins, I will definitely give the recipe a try. 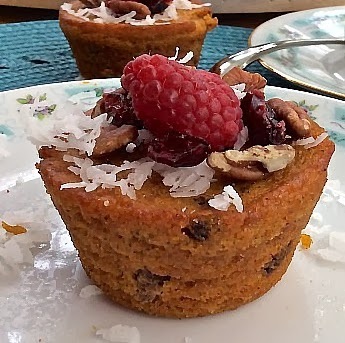 Thanks so much for sharing your recipe with Foodie Friends Friday party this week. I've pinned and shared. Oh my goodness these muffins look amazing!